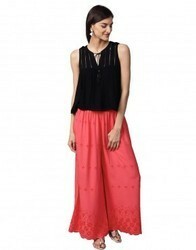 Miss Chic offers this delicately embellished rich embroidered Palazzo pants. of pure cotton fabric.This is a perfect for women who are fond of stylish wears.Match with stylish tops and funky jewellery .It is a must have in your wardrobe .They are light in weight and comfortable to wear. We are an illustrious retailer of a wide range of Black Floral Embroidered Palazzo that are mostly cherished by the ladies owing to their fascinating designs. Lucknowi Chikankaari Red Hand Embroidered Rayon Soft Comfortable Plazzo Crafted By Indian Handicraft Standards. Features Is on net fabric topwith all over dual tone sequin work and heavy floral embroidery at neck, chiffon fabric dupatta in jarkan work all over and orange colour heavy gorgette fabric bottom. 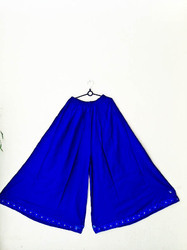 - Beautiful Women Lucknow Chikan Art Work Embroidered Cotton Palazzo.